Lord, thank you that you are gracious in our shortcomings. We confess that we forget that there is no condemnation for those that are in You–help us remember this and walk in freedom! Thank you for genuinely delighting in us. Let us rest in that. We are secure in You. All to often I focus on what we aren’t good enough at, where I lack. I don’t look at what I am actually good at. Thanks for the reminder! So happy the Lord encouraged you with this today! Her beautiful verse was actually taken from 2 Corinthians 12 (not 2). Thank you for your beautiful words of strength! Thank you for this message. It’s a beautiful message about how God focuses on us – so different from the world. The scriptures are located in 2 Corinthians 12:9-11. You have 2:9-11 listed. I was blessed by 2 Corinthians 2 also and also blessed by the search to find out where they really were located. Loved this devotion so much I wanted to highlight the scripture in my Bible but couldn’t find it. Thankfully Google did – LOL! I’m sure it’s just a typo that Chapter 2 should actually be 12. Thank you for reminder to focus on our strengths! Thank you for this beautiful reminder! I live with a hyper critical person and I have to constantly remind my self that God loves me the way I love my children. I also need to check myself and ask for forgiveness when I find myself judging others. God bless you! We are often harder on ourselves than the Lord is aren’t we?! All is grace girl! I often look at the fact that I didn’t graduate from college with a degree in anything I have a certificate in Early Childhood Education Early Intervention and Dietary Management. But the jobs that I have worked and I have done a good job cause me to feel inadequate not good enough, the way the world see us and reflects how we sometimes view ourselves. 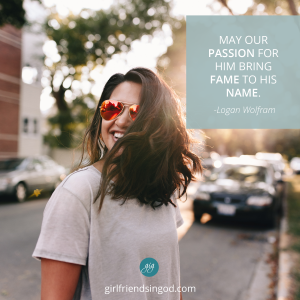 I am so glad he is not looking at my inadequateness but he see me made in his image and likeness and I am loved not because of, but in spite of he is not condemning me. Thank you Lord for your grace and mercy and thank you Logan for this wonderful devotional. Love hearing this that the Lord reminded you of your true worth and adequacy in Christ!